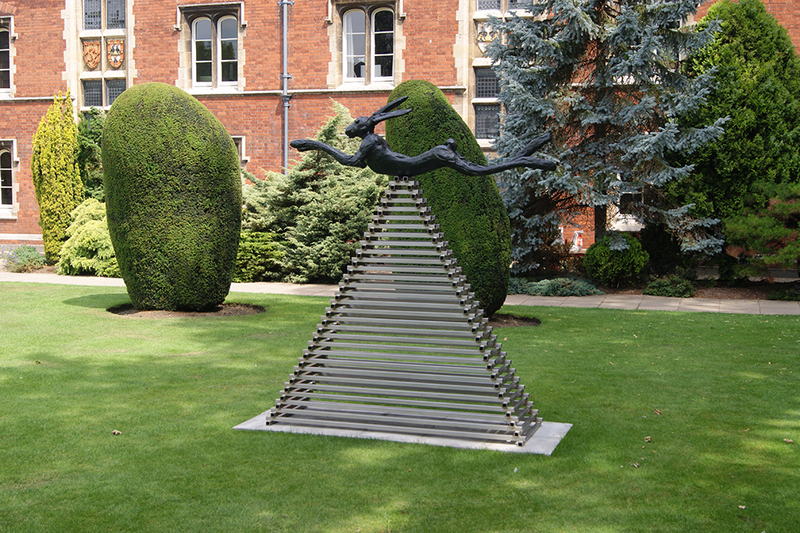 Barry Flanagan donated two sculptures to Jesus College, The Cricketer in 1989, and San Marco Horse in 2009 shortly before his death. 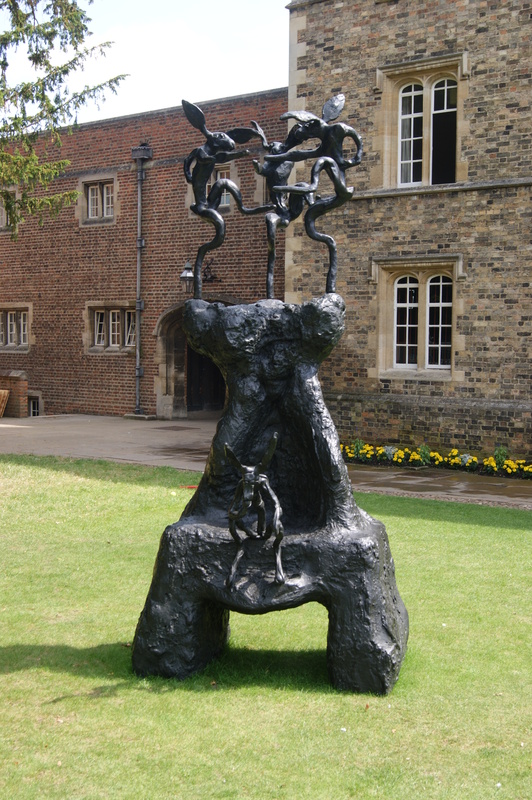 It was in fact the Horse that arrived first, in 1988, for the very first occasion of Sculpture in the Close. It has remained in the same position, in First Court, ever since, and has acquired iconic status as well as the affection of several generations of students. 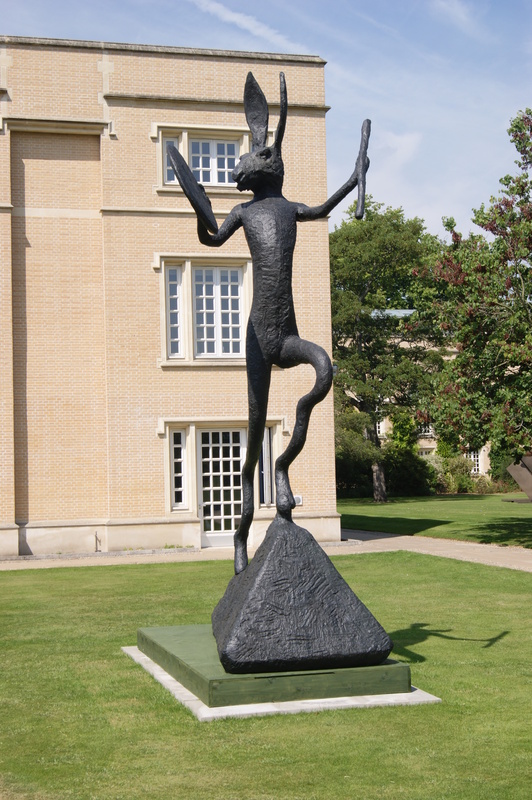 At first blush, these two works seem to point in different directions, with the Horse assuming the gravitas of art historical credentials, while the Cricketer, one of Flanagan’s most exuberant representations of hares, implies a spirit of truancy and even of frivolity. But there are ways in which these two charismatic bronzes merge their concerns. The relative sobriety of the horse is misleading, and its direct allusion to the history of equestrian statuary is ambiguous, to say the least. It reproduces very closely the characteristic pose of monumental equestrian works from the Classical and Renaissance periods, including the most authoritative example of all, the equestrian statue of Marcus Aurelius in the Campidoglio, Rome. 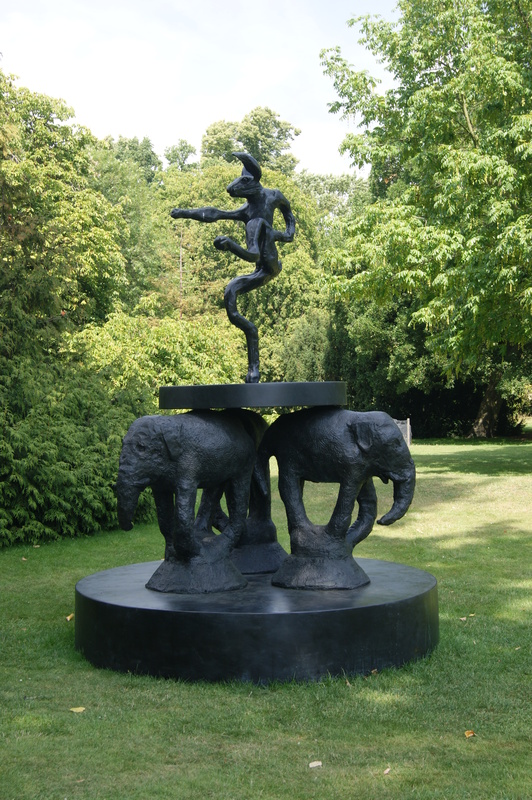 Such works celebrate political power in the spectacle of the rider capable of restraining and controlling the movements of an animal many times more physically powerful than he is. By dislodging the rider, but retaining the animal’s pose to remind the viewer of precisely what is missing, Flanagan subverts the tradition and turns the deliberately incomplete ensemble into a celebration of the horse’s own grace, strength and poise. It is this self possession that also epitomises the hare, ubiquitous in Flanagan’s output of the last 30 years. But while the riderless horse remains calm in resigning from its role as emblem of civic order, the hare is antic, disruptive, flamboyant, carnivalesque. That said, there are plenty of anthropomorphic mannerisms in these eccentric figures, as well as comic references to both high and low cultural models; they often resemble cartoon characters making claims to an absurd kinship with the spare and elongated forms of Giacometti, an association that is not lost upon Bruce McLean, whose most recent paintings have created walk on parts for these unlikely accomplices. But the anthropomorphising is less often the expression of a desire to reform the hare by making it conform to our inherited patterns of behaviour than to find something of the maverick figure of the hare in our own unresolved selves. 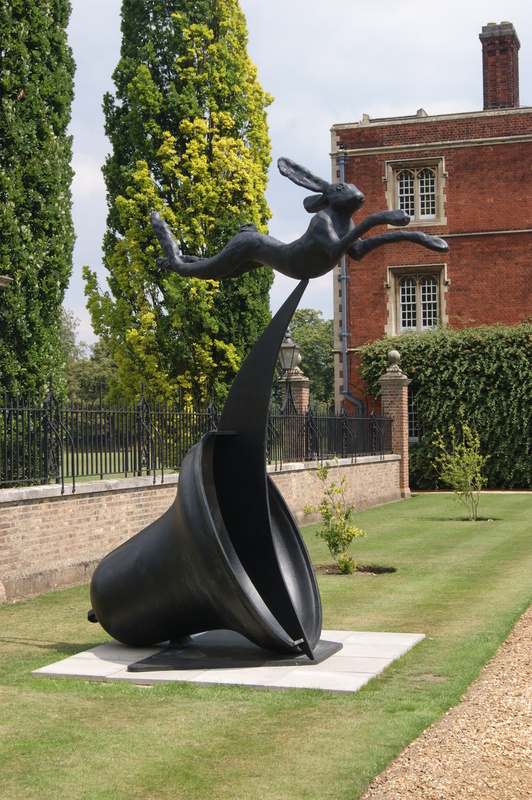 As Jo Melvin has pointed out, Flanagan’s work shows that he has repeatedly associated physical agility with an ability to make imaginative leaps, and it is this impromptu inventiveness, and the performative ingenuity attaching to the image of the mad March hare, that has underwritten his own enduring fascination with this headlong acrobat. 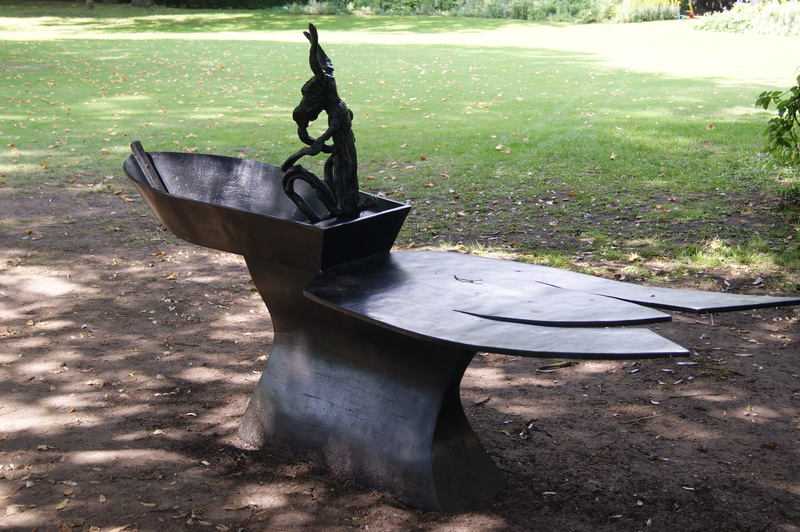 ‘Starting a hare’ is a phrase that refers to the pursuit of irrelevant issues, but it is precisely this readiness to explore avenues that seem unpromising to the conventional mind that has earned for Flanagan’s most familiar leitmotif a justified reputation as one of modern sculpture’s most fitting emblems of creativity itself.